Everything from photography, to television, to printers made the eventual evolution from black and white to full color. 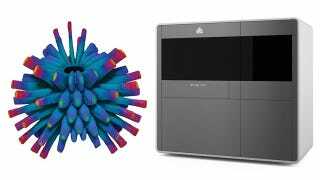 And following in those technological footsteps is the 3D printer, with 3D Systems recently announcing what it's claiming is the world's first continuous-tone full color plastic printer called the ProJet 4500. Specific pricing and availability hasn't been revealed just yet, but the ProJet 4500 will produce plastic semi-rigid full-color parts complete with gradient transitions between the various tones. The 4500 looks like it uses the laser-sintering approach to 3D printing, where a laser is used to harden a powder-like material layer by layer—instead of the more popular extrusion technique used by cheaper printers hitting the market recently. And while some extrusion printers do offer multiple color options, they can only print with one color at a time, and the tinted raw materials can't be mixed to produce other or even in-between tones.